Recent contemplative writers have outlined three different layers of spiritual practice, bringing wholeness on the individual, communal, and greater social levels. The first kind of practice like Centering Prayer allows us to rest in the presence of God and experience inner transformation. The second, like Sabbath, Confession, Worship, and seasonal reflection helps maintain the health of a community. The third, the service or missional practices, are meant to help move society itself toward wholeness or shalom. These would include work toward inclusion, peace, justice, and hospitality. As beginners on the contemplative path, we first have to clean out the inside of the cup (Mt 23:26) or allow the inner transformation to take place through the unloading of the unconscious. Our focus, then, is on contemplative practices for the individual, but the ultimate hope is that this transformation radiates outward into all facets of life, in the familial, communal, economic, and political spheres to help open ourselves to shalom to the greatest extent possible. Here are some of the many available spiritual practices that Christian contemplatives, mystics, and monastics have drawn on over the centuries. I’ve included descriptions of several of them below, though this list is by no means exhaustive. See what resonates with you and what you may be called to practice given where you are on your current path. Centering Prayer is a method based on the 13th century English devotional classic The Cloud of Unknowing that lays the inner groundwork for entering into Contemplative Prayer. The silence we cultivate during this time prepares the faculties to receive and our hearts to be transformed. It is a consent to God’s presence and action within, a God who is nearer than our very breath. It is not intended as a replacement for regular prayer practices, but to provide a deepening and expansive context for them. 2. Sitting comfortably and with eyes closed, we settle briefly and silently introduce the sacred word as the symbol of your consent to God’s presence and action within. This can simply be an upright, relaxed position in a comfortably sized chair. We keep the back straight, let go of all thought, and gently introduce the sacred word. 3. As thoughts arise, we return ever-so-gently to the sacred word as a signal to release the thoughts. Thoughts here include emotions, images, memories, sense perceptions. In short, any distraction. 4. At the end of the prayer period, remain in silence for several minutes to transition back to ordinary flow of consciousness. It may help to have a transitional practice, like reciting a Psalm, a verse, or Our Father. The minimum recommended time to practice is twenty minutes twice a day. The purpose of the practice is not radical change during the experience itself, but during the rest of the day. Do not be discouraged in your practice if you swing from pleasant experiences to emotionally charged experiences. Part of the unfolding process is an unloading, or identifying and releasing some of the pain we accumulate and store in our unconscious. This practice is a simple means of cultivating a deepening intimacy with the God who is always already present. For more from Contemplative Outreach, click here. 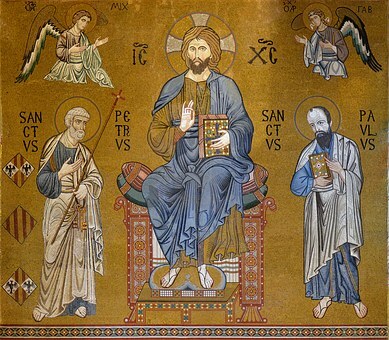 Lectio Divina or divine reading is a way of reading Scriptures long practiced by monastics, consisting of multiple slow readings of a small section of Scripture. Instead of analyzing on the mental level of discursive thought, we open ourselves to the words, we rest in the words, we partake of the words, opening up our inmost being to the possibility of insight and transformation. 1. The first stage is Lectio or reading. We read the word slowly and reflectively, steeping ourselves in it. Short sections, a couple of verses at a time, work best for this practice. There are many sources for short daily meditations, whether in the Book of Common Prayer, or many online sources, often associated with monastic or contemplative orders. 2. The second stage is Meditatio or reflection. We simply reflect deeply on the words and images of the text. 3. The third stage is Oratio or response. We leave our thinking aside and simply let our hearts speak to God. This response is inspired by our reflection on the Word of God. 4. The fourth stage of Lectio Divina is Contemplatio or rest. As much as possible, we let go of all thought and simply rest in the word, listening at the deepest level of our being. We open ourselves to an inner transformation and realignment according to the divine presence. These are general guidelines, not a fixed, formal sequence. The natural movement of the practice is toward an inner silence, allowing deep to call out to deep. The practice can be done individually or as a group, but if as a group, a facilitator would be required to indicate the movement to the next stage, and there may be less fluid back and forth between the stages as with individual practice. Much like the practice of Centering Prayer, it is recommended to say the Jesus Prayer for 15 to 20 minutes in the morning, before noon, or in the evening. This, in a sense, imprints the prayer in the inner person. When stress or difficult situations arise, the practice is there beneath the surface and the prayer provides an underlying rhythm we can find inner equilibrium. After longer experience with the Jesus Prayer, practitioners are sometimes led into the practice of stillness or silent prayer. For more on the Jesus Prayer, watch Clint's video on the practice here. I let go of my desire for security. I let go of my desire for approval. This practice, championed by Zen master Thich Nhat Hanh helps us keep our awareness in the present moment. For many, the act of walking and maintaining fluid motion helps stay attentive and alert in the present. Set aside a specific time to walk, roughly twenty minutes with no technological devices to distract you, and pay attention to the quality of your awareness. Begin by standing still and taking several slow diaphragm breaths. Follow the breath in and out. Then begin walking. As you walk, gently let thoughts go as they bubble up. Keep your awareness focus on the act of walking, how it feels in different areas of your body, the heels, the soles, the legs, the lungs, the arms. Notice colors and sense impressions on the external level. But stay attentive to the interior space at the same time. Try not to get caught up in thoughts, labels, or mental stories. Notice the rhythm of movement and bring your awareness back to the body when thoughts bubble up. When you become aware of inner tension, recognize it, and let it go. You may need to slow your speed as you go and recognize you are there simply to enjoy the experience of being a body in motion. This practice is a staple of Ignatian spirituality and part of the month-long retreats as practiced by St. Ignatius, founder of the Society of Jesus or Jesuit order. The Jesuit practice is to see God in all things. The Examen is a reflective practice that brings awareness of God at work in our life throughout the day. 2. Give thanks for the gift of this day. 3. Carefully look back at your experiences of the day, reflecting on where God was present in events, people, and experiences. 4. Be sensitive to shortcomings in life or areas that need attention. Hold them in your awareness and be present with them. 5. Ask for wisdom to discern God’s presence in the day to come.